Tamarack has recently formed a partnership with Tree Canada - a non-profit foundation dedicated to the renewal of Canada's urban forest. Together we have designed a programme of songs and stories about trees, and how they influence our environment and contribute to our quality of life. This upbeat, energetic, interactive concert stimulates discussion of environmental issues, problems, and solutions. It is especially aimed at showing students that they can have a direct hand in improving the environment, and become responsible agents of positive change. In our presentation we point out many of the ways that trees affect us every day. We also point out some of the ways that people affect trees. Then we make sure that students realize that the tools of environmental restoration can be taken up by anyone who cares enough to try to make a difference. We always have time for questions, answers, and discussions with the students. 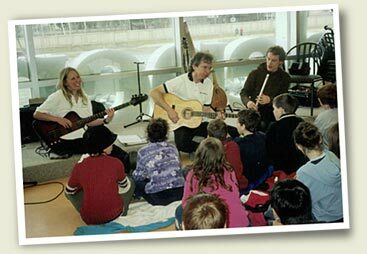 Tamarack has run this concert/workshop for dozens of schools in eastern and northern Ontario, and Manitoba.